The mark-up on pizza is astounding. Make your own and you won’t look back. I learnt this recipe on a course at River Cottage and the dough is the best I’ve tried. Get the oven as hot as possible well before cooking. Put the flours in a bowl and make a well in the centre. Pour in the sponge, salt, oil and remaining water and mix, gradually bringing in the dry ingredients, to form a wet dough (don’t be tempted to add too much flour). Knead for 10 minutes until satiny and elastic. Put in a clean bowl, cover with a cloth and leave somewhere warm for 1 ½ hours, or until doubled in size. Preheat the oven to 250°C/480°F/gas mark 9 and put in pizza stones, unglazed terraotta tiles or baking sheets. Plomp the dough on to a lightly floured work surface and knead for 2 minutes. Divide into two and roll each piece into a 30cm (12 in) round. Put on well-floured baking sheets or large pieces of cardboard to support them while you add the topping. 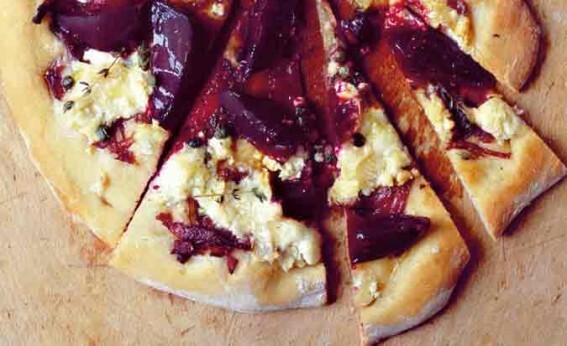 Top with the onions, cheese and beetroot. Season and drizzle with oil. Slide on to the hot stones or baking sheets (oil baking sheets at the last minute). Bake for 15 minutes, scattering with capers 5 minutes before the end. Serve immediately.